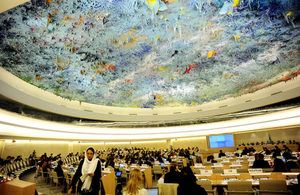 The UK welcomed Eritrea’s engagement with the UPR, but urged cooperation with the Special Rapporteur on the situation of human rights and to reform national service. The UK welcomes Eritrea’s engagement with the UPR process, and urges cooperation with the Special Rapporteur and with OHCHR. We remain concerned by the human rights situation. We urge Eritrea to reform national service, especially given political progress in the region and the reduced threat to national security. We note that the Government states “no citizen is imprisoned on account of beliefs,” and would welcome further assurances on this. We urge the Government to allow the international community to verify the progress claimed in paragraph 85 of their report regarding places of detention. Open all places of detention to organisations with expertise in the field, such as the ICRC.